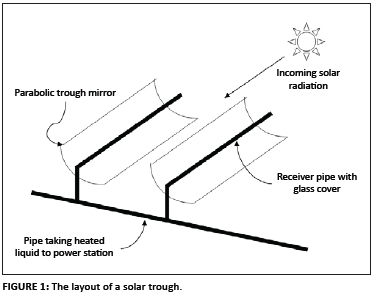 In this article, we present a solar trough system in which the receiver pipe is enclosed in a glass cover under vacuum. 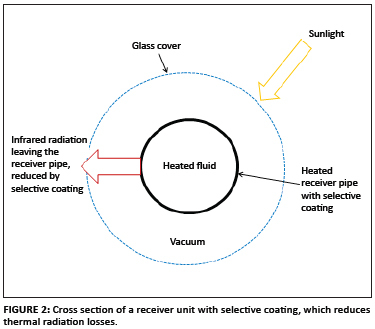 The dominant radiation losses from the receiver are reduced by the use of a 'hot mirror' on the glass cover instead of a selective coating on the receiver pipe. We present the results for a general heat transfer model and compare the performance of a selective coating with that of a hot mirror, using simulations. We determined that a hot mirror is a viable alternative to a selective coating, and certainly allows higher temperatures of the working fluid. We recommend the use of a hybrid system, in which a selective coating is used in the part of the receiver pipe in the low temperature region, and a hot mirror is used in the high temperature region to reduce radiation losses. Our focus in this study was medium-temperature to high-temperature solar trough technology (100 ºC to 350 ºC). The solar trough is amongst the most-studied solar systems.6 The largest solar trough power plant in the world, the SEGS (Solar Energy Generating Systems) in California with a peak capacity of 364 MW, has been operational and studied in detail since the mid-1980s.6 Solar trough systems consist of long, cylindrical parabolic mirrors and a similar length of receiver unit (absorber tube) through which a 'working fluid' circulates (Figure 1). The receiver consists typically of a glass cover which encapsulates a metal receiver pipe such that a vacuum is formed in between (Figure 2). 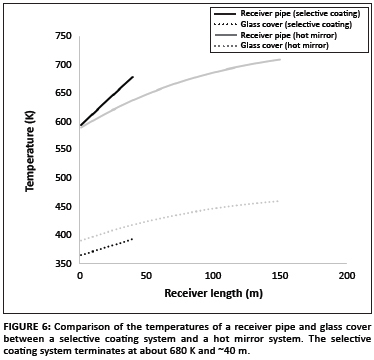 The vacuum minimises convective losses from the heated receiver pipe to the surroundings.6 Conduction losses are reduced by minimising the contact between the receiver pipe and the glass sleeve.7 Thermal radiation losses are reduced by the use of a selective coating applied to the receiver pipe.8, 9 All aspects of the receiver units are topics of ongoing research, such as the optical, thermal and chemical properties of all the materials concerned; the vacuum integrity; thermal expansion; and which working fluid should be used.6 In this study we focused on the possibility of a substitute for the selective coating, namely a hot mirror coating on the glass cover, which could both decrease radiation losses and raise the operating temperature of the working fluid. The selective coating is a dielectric material that absorbs well in the visible region of the spectrum (i.e. sunlight) but emits very poorly in the infrared region, which is the radiation that is lost from the receiver pipe.8,9,10 By using such a material, the dominant heat-loss mechanism at high temperatures (namely, radiation) can be diminished (Figure 2). 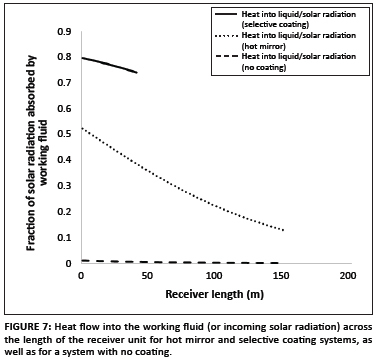 A selective coating on the receiver pipe renders the system more efficient in terms of the fraction of solar energy absorbed by the working fluid, thereby heating it. Numerous work has been published on selective coatings on the receiver pipes and their properties.8,9 Some researchers have investigated ways to improve the optical properties such that the selective coating becomes more efficient at withholding heat; whilst others have sought to improve the thermal stability of the selective coating. Data from experimental facilities such as SEGS and computer simulations provide valuable insight on the effectiveness of selective coatings. The aim of research into selective coatings is to create a stable, efficient coating over a wide temperature range (0 ºC - 1000 ºC). The main weakness of commercial selective coatings is that they deteriorate thermally at temperatures of about 680 K (~400 ºC),1,8,9,11,12 thereby restricting the maximum temperature to which the receiver pipe can be heated, and hence the Carnot or Rankine efficiency of the subsequent heat to electrical conversion.13 The temperature of the receiver pipe rises with its length, hence the receiver pipe length is restricted to a maximum length, after which thermal breakdown of the selective coating occurs. Therefore in this study, we investigated the theoretical performance of an alternative to the selective coating: the 'hot mirror'. A 'hot mirror' refers to a dielectric coating that is designed to reflect the infrared region of the spectrum and to transmit the visible region. 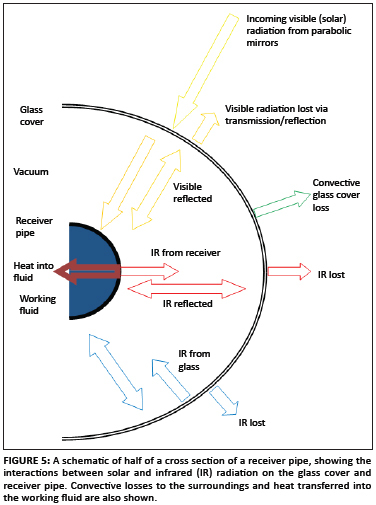 The hot mirror reflects infrared radiation emitted from the receiver pipe back onto itself, thereby reducing the amount of thermal radiation leaving the receiver unit (Figure 3). The net effect is similar to that of the selective coating. The hot mirror coating also breaks down thermally at about 680 K.7 In our model, the hot mirror is applied to the inside of the glass cover, which is about 200 K cooler than the receiver pipe during operation. 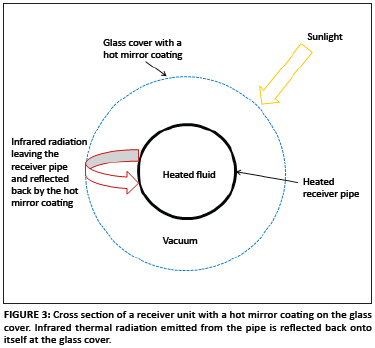 It is therefore possible to sustain higher temperatures in the receiver pipe using a hot mirror on the glass cover instead of a selective coating on the receiver pipe. This additional temperature increase is transferred to the working fluid, and subsequently to the steam power station, where it should improve thermal effciciency.8 In essence, therefore, we are addressing the problem of the temperature ceiling (~680 K) in existing systems, because the use of a hot mirror sidesteps the problem of thermal decomposition of the selective coating and thereby allows for a higher temperature of the working fluid. where ε is the emissivity of the material, σ is the Stephan-Boltzmann constant and T1 and T2 are the temperatures in Kelvin of the surroundings and the material, respectively. where hv = ac + bw.u and ac is the convection factor, bw is the wind factor, u is the wind speed (m/s),1,11 Ag is the area (m2) of the glass cover and Tg and T0 are the temperatures (K) of the glass cover and the surroundings, respectively. 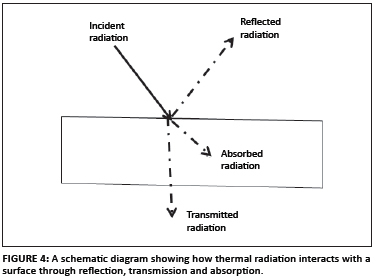 Radiation interacts with a surface via the mechanisms of reflection, transmission and absorption (Figure 4),1,11,14 where 'r' and 't' are the reflection and transmission coefficients, respectively, and absorption (a) = 1-r-t. In each case, the superscript refers to whether the term of interest applies to visible (v) or infrared (IR) and the subscript refers to the physical location, being either on the glass cover (g) or the receiver pipe (r). 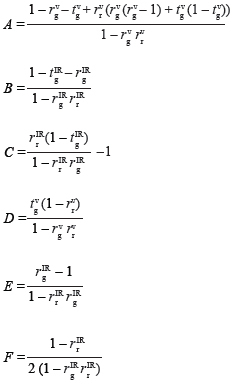 A more realistic, but complex, model can be created if some or all of the following major approximations are addressed. The model is nevertheless suitable to answer the main questions posed in this study. The approximations used in this calculation were, firstly, the strict division of the radiation into visible (defined as 390 nm - 2000 nm) and infrared bands (mid-infrared to far-infrared, 2000 nm - 7000 nm). Coatings have different and complicated interactions within these regions, and average constants for both absorption and transmission were assumed. The averages were chosen to be close to the value near the dominant wavelength, found from Wien's law.1,2 Defining the visible part in this way further allowed us to ignore the infrared interaction from direct sunlight with the glass cover, which should be analysed in a more detailed model. These effects are likely to be similar for both the selective coating and the hot mirror coating.